A name HIDDEN IN PLAIN VIEW! THIS IS NOT A SPOILER! With the Tenth Doctor’s ties very much back in the news lately, I have come across something I had never previously known - and something which if you’re a Tennant fan know you will kick yourself over. The final episode of Series Seven, due in only a few weeks, is titled The Name Of The Doctor and is already dividing fans before the plot is even truly known. It's all still waiting for you: the fields of Trenzalore, the fall of the Eleventh, and the question! The first question! The question that must never be answered, hidden in plain sight. The question you've been running from all your life. Doctor who? Doctor who? Doc-tor *who*? Well - this hasn’t ANYTHING to do with The Name Of The Doctor, but it does relate to names in plain view. One of the most popular ties worn by the Tenth Doctor was Tie Four, the Christian Lacroix - commonly known as the swirly tie. Well, it appears there is more to those random swirls and patterns than meets the eye. I came across a listing on eBay for old Lacroix tie dating from the 1990s - and it has a very interesting label inside the lining of the tie. The logo incorporates an abstract twisted line, something very in during the 1990s, forming a C and L for Christian Lacroix - and it is a perfect match to the swirl at the bottom of the Swirly tie! That bottom piece of the design IS the Christian Lacroix logo, bold as brass, three inches square - HIDDEN IN PLAIN VIEW! How did we miss that?! Today is April 23rd - St George’s day - the patron saint of England! So how appropriate to talk about Tie Ten, the St George by Duffer tie. I keep an eye on eBay for any screen accurate Tennant ties almost as a matter of habit. It’s a lonely quest and often fruitless. There are two divisions of ties: the cheap and plentiful (such as the Thomas Nash, Daniel Hechter and St George by Duffer) which retailed for £15 to £20; and the more expensive and exclusive (such as Christian Lacroix, Giorgio Armani and Nina Ricci) which retailed for £60 plus. The problem is the cheaper ties, although many more were made, they are seen as cheap and cheerful so not worth anything. They tend to end up in the bin or given to a charity shop. The more expensive ties tend to be retained due to their price, but if they are unwanted have a chance of appearing on eBay. 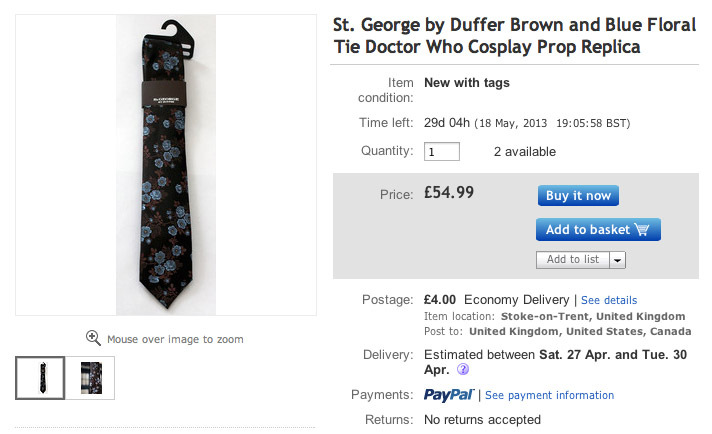 This week saw two Tenth Doctor ties, one from each group (though one was a colourway variation) up for sale on eBay. I’ve seen this Giorgio Armani tie once before, and have this colourway myself. It is totally identical in weave to the brown and blue version worn by the Tenth Doctor, but this one is in shades of grey. it is just like a black and white photograph! 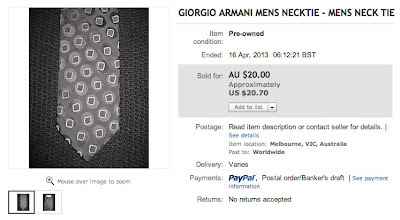 The Australian seller of this tie was out for a quick sale, and it sold for a meagre AU$20! 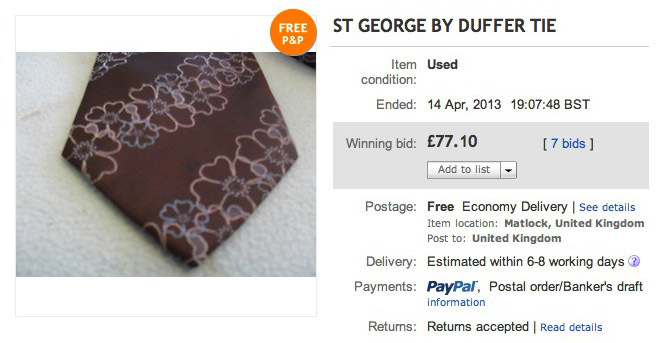 I've barely got home from buying a few ties myself, and I see others are already appearing on eBay! Strike while the iron’s hot I suppose, and to be fair, that’s not a bad price considering. With all this news of NEW ties for the Tenth Doctor, I thought it right to get my Tie Index bang up to date. 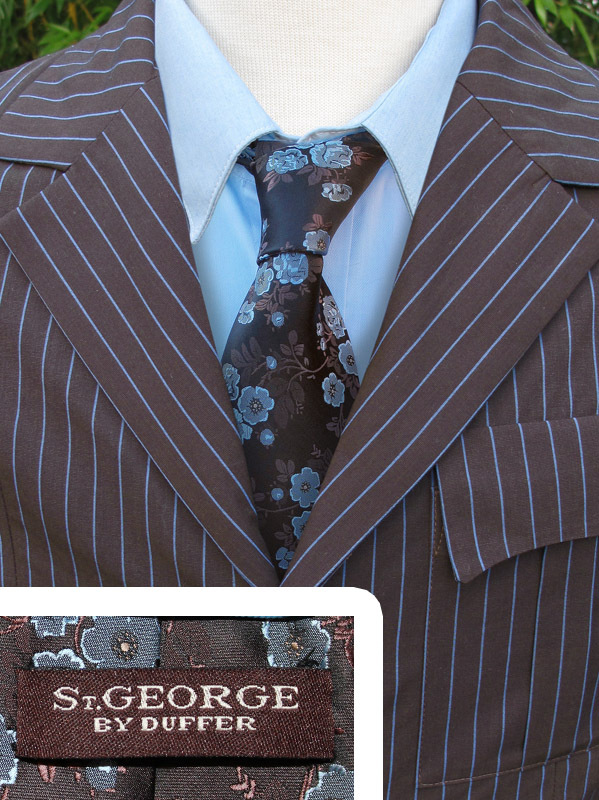 I’ve therefore added the St George by Duffer tie, and some nice pack-shot images. I’m gonna do some other detail views of the tie soon for those who can’t get hold of one, so check back soon. 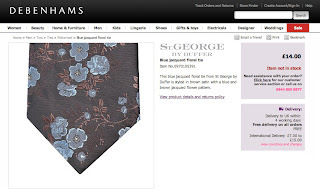 I’ve spent the past couple of days visiting various high street branches of Debenhams, seeking out the St George by Duffer tie that the Tenth Doctor will be wearing in the upcoming 50th Anniversary Special. Some things have come to light which I think it is worth mentioning to help clarify the situation and dispel some myths circulating online. 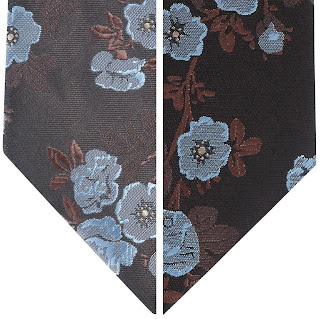 First up, the correct tie being worn is the Blue Jacquard Floral Tie, which I gave the link to a couple of days ago. This, as many people have now discovered, is out of stock on the website and several people I know had their orders cancelled even when it was in stock, citing insufficient items. Basically they oversold it. 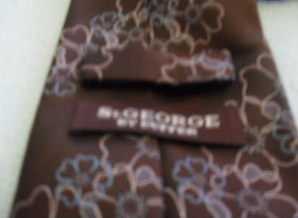 However, there is an alternative, called the Brown Jacquard Floral SLIM Tie. On the website it looks to be the same pattern, but with a darker background. You can see by putting the two side-by-side they are notably different. With this in mind I was looking out for the two versions of the ties in-store. 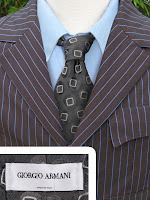 The wider screen-worn tie is way rarer than its narrow counterpart. I saw a dozen narrow for every one wide. 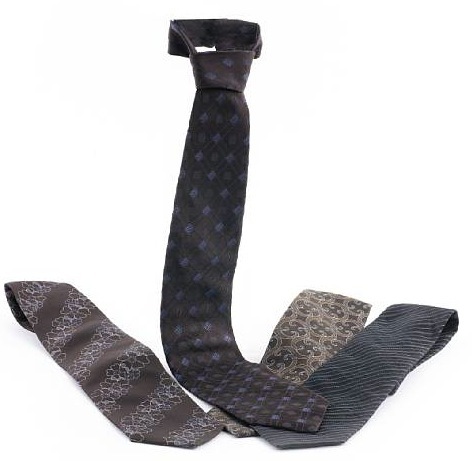 The narrow tie is made from exactly the same fabric as the wider one, in precisely the same colour. Here are some proper side-by-side comparision pictures to show you. The slim tie is on the left, the screen-worn on the right. 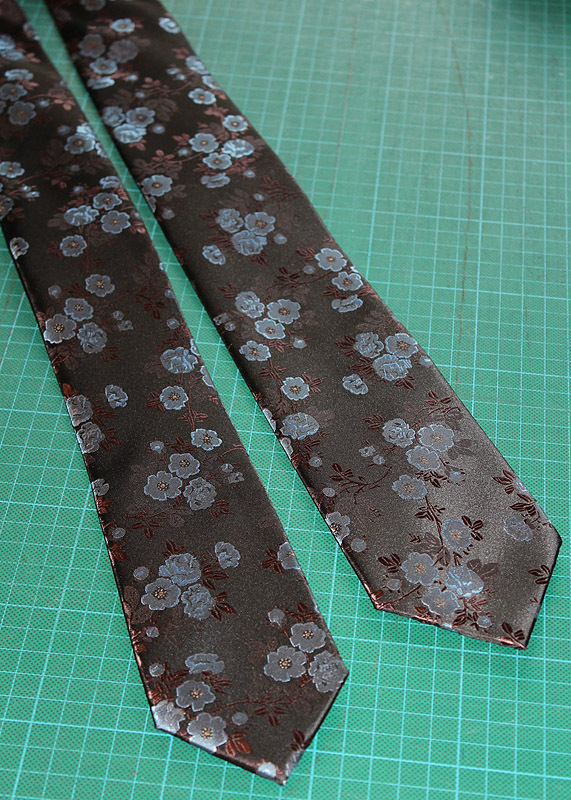 As you can clearly see, the two versions of the tie are made from exactly the same fabric. There is no difference in the pattern at all. So - let the bun fight commence! 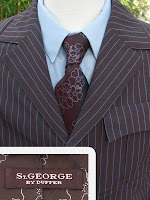 Now the new Tenth Doctor tie is positively identified, the rush is on the grab the available stock before they sell out. This is very much a phnonom of the past few years, and was something that never seemed to happen while David Tennant was in the role. No-one paid much attention to The Doctors ties - it was all Rose Tyler jackets and jeans. It wasn’t really until the Bonhams auction that any of the labels were really widely known, and that was well after Matt Smith took over the role. Around that time we had the ID on the Eleventh Doctor's Paul Smith shirt; TopMan jeans; and All Saints Layer Boots, the later of which were highly prised at the time. 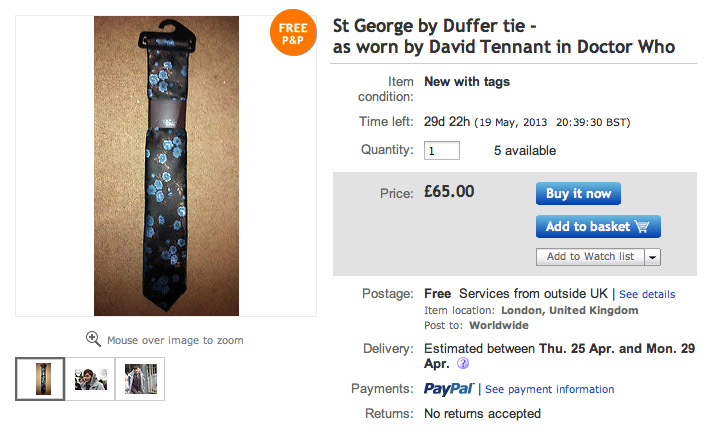 So to now see the mad rush over a Tennant tie seems out of place! But who can resist? 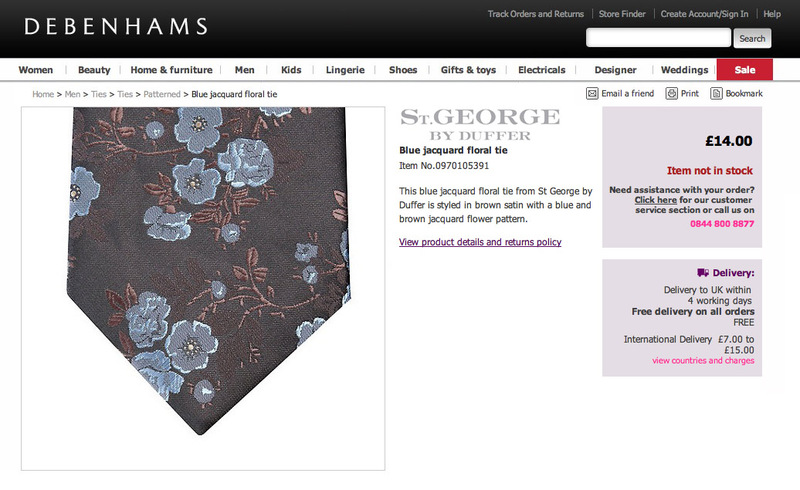 If you’re a big Ten fan, and there’s a tie sitting in your local branch of Debenhams - you’re gonna want it, especially if its only £14! 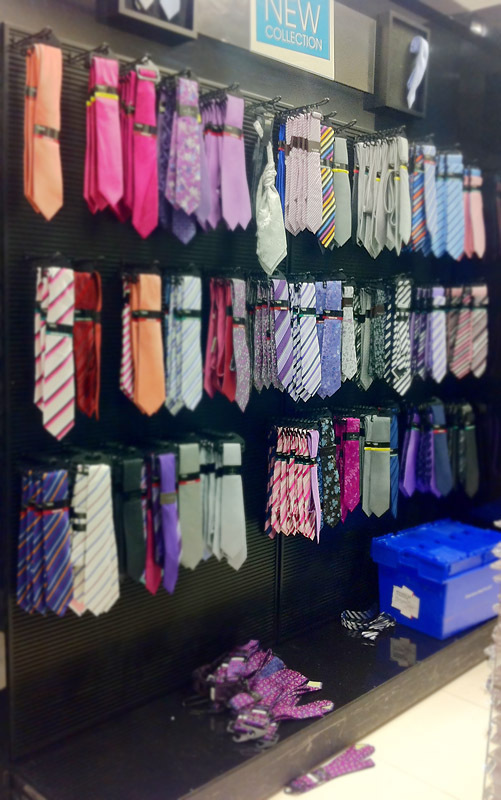 So yes, I’ve got sucked into this frenzy of tie hunting, and yesterday spent a fair part of my time traveling around the stores within striking distance of where I live. I happened to be near Hemel Hempstead first thing in the morning, so was waiting outside their doors at 9am like some sad bargain hunter in the sales! 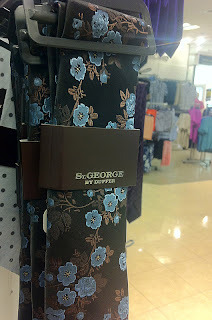 I didn’t have too much time, so I quickly found the menswear department and their substantial tie display. 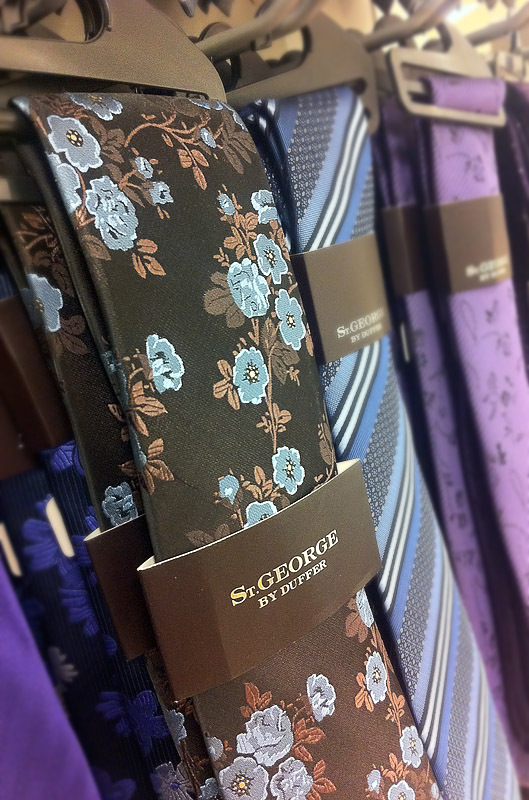 Scanning through all the ties is like reading my Tie Index, with Thomas Nash, Rocha John Rocha and finally St George by Duffer. And sure enough, there it was. It’s funny to see the tie on the rack just waiting to be picked up. Of all the ties on sale, this is the only one that conforms to Louise Page’s criteria for a tie to go with the brown suit. 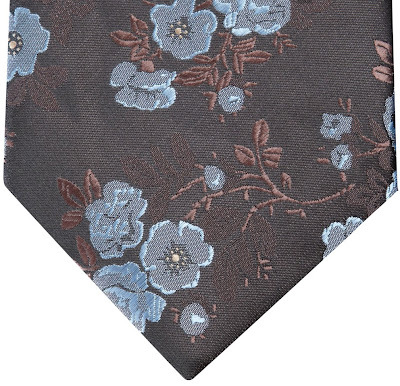 To be appropriate it must be mainly dark brown, with a pattern or accent in light or sky blue. Moving on I took a train into London and first went to the Westfield shopping centre at Shepherds Bush. Their tie display was hidden out of sight behind a wall, so took me a moment or two to find! Again it came up trumps, but this time only one of the screen accurate ties was on the rack. If you look in the photo (above) you might be able to see it on the bottom rack, about centre. 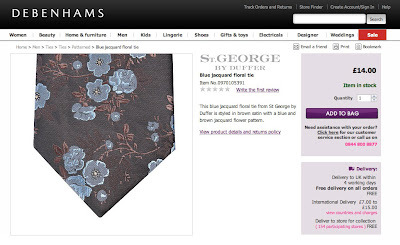 I nabbed the tie and moved on to Debenhams flagship store on London’s Oxford Street. The store is going though some MAJOR renovations with only one of the three escalators working, so finding my way down the the menswear in the basement was a challenge! It proved a bit fruitless as there were none of the screen accurate ties on the shelves at all. I guess some Ten cosplayers has been here before me. Good lads! From here I headed north to Harrow, which has a shopping centre I used to visit a lot in my youth when I lived in the borough. This was to be my last store visit today and proved to be rewarding, with three of the screen accurate ties just waiting for me to buy them. As you may work out, I have a tie for myself and a few spares. 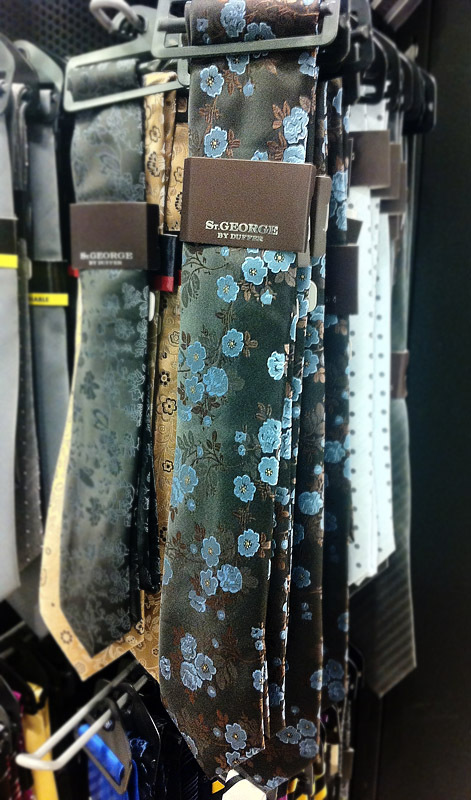 If you are having difficultly obtaining a tie, let me know as I might be able to help out. After the excitement in Trafalgar Square last week, filming continues apace on the 50th Anniversary episode. It’s been widely reported and is common knowledge that David Tennant is back as the Tenth Doctor. 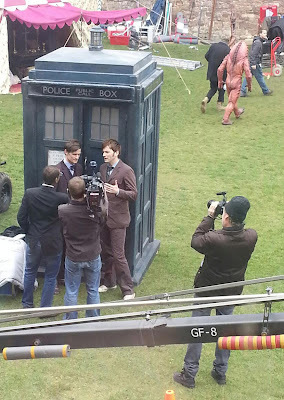 He has been spotted filming with his TARDIS, but as yet he has not been seen in costume with Matt Smith - until today! They have been shooting at Chepstow castle, and some pictures have emerged on Twitter and Tumblr. Matt and David can be seen being interviewed by Lizo Mzimba, who regularly reports on the antics of the Doctor Who crew. 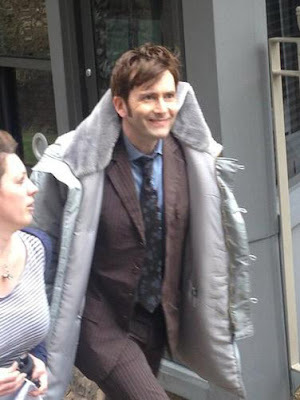 But a picture of greater interest to me shows David walking onto set, in costume, and wearing A NEW TIE! 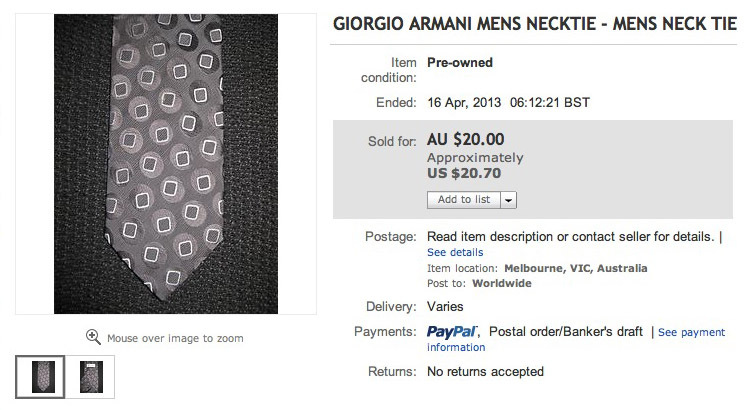 Knowing the ties inside out, I can confirm this is NOT a tie previously worn. We'll have to call it Tie Thirteen! But through the interviews I did with Louise Page, and knowing the labels of eleven of the twelve ties worn by the Tenth Doctor, I have some insight into where the ties were sourced. 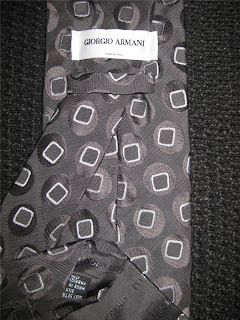 Tie Three (Yves Saint Laurent), Tie Four (Christian Laxroix), Tie Seven (Giorgio Armani), Tie Eight (Nina Ricci) all came from prestige store Selfridges, and cost £60 plus when new. Tie Two (Daniel Hechter), Tie Five (Thomas Nash), Tie Ten (St George by Duffer) were found at Debenhams, a more modestly priced department store where they were around £20 when new. My first point of searching was the cheaper option, and it took me 30 seconds to stumble across a St George by Duffer tie in brown with a blue floral design. I think we have a match - and it’s only £14 new! RESULT! !